A friend told me about this organization. I haven't checked it out in person. It sounds like they have a lot of fun. Teaching different dances around town and meeting to socialize and do the Lindy Hop or the Charleston and other swing dances at rotating locales. I watched a performance of the Garth Fagan dance troupe here. It was incredible. From what I can tell, they book great acts. Southtown is a group of artists. Artists tend to group together for inspiration. The fact is, human beings draw creativity from one another – the mysterious process of being known and being in a community leads to ideas and the expression of those. Observations about life, which is a lot of what art is, cannot really be experienced in isolation. Check out this area of town next to the King William district. There are some good restaurants around there (Rosario's - Tex Mex). The group of shops and galleries along South Alamo Street and North Saint Mary’s represent a nice cross-section of San Antonio's mediums and styles. The feel of the place is a mix of young and trendy, with fun and creative. It has a lot of rough, colorful character in its buildings. I didn't visit this event myself, but check out our friends photography website (under links), or the event website for more information. It looks fabulous. Lots of arts organizations come together to present a collection of night-time wonders, including colored lights shining on the fronts of downtown buildings (the Alamo), and a Symphony concert. Felt like we were in the land of Narnia. These big, bleached grey trees were down at the edge of the (low water) river. They had tangled roots above ground and wind-woven branches. The river was clear, green, wide. It was very quiet the day we went and we heard rippling water, screechy birds, crunchy leaves, sausages sizzling, and the bang of kids' feet on a slide. ... is really very amazing. Yes, it's a store, but really so much more. I'm not even being paid to say that. It has an artificial lake, waterfall, stuffed animals & fish galore, all over the store - diorama style. Super customer service. Attentive and knowledgeable; large dressing rooms - tidy, with good lighting. My first impression was "fake," but it grows on you, with it's reminders of activities people spend time doing, enjoying real nature. There are lots of boats for sale. It's a total shopping experience, including indoor archery and gun ranges, and a restaurant. There's even a climbing wall for kids, a kids' shooting range (pop, pop, pop, while you're trying on clothes), and fishing demonstrations with live sea urchins. Even if you’re not generally into amusement parks, there is fun to be had at Six Flags Fiesta Texas. To begin with it's built into an interesting location in a former quarry. Stripped rock walls surround the blue, or red metal spirals of The Rattler and Tony Hawk’s Big Spin. Tweens and teens have voted their favorite ride The Superman, because of its twists, turns and hills. The Goliath is fun and scary in a good way, for those with older necks and backs. It spins and dips but is also smooth. In the Boardwalk section, The Frisbee spins and swings almost upside down. It is much more fun than you’d think to look at it. One might want to sit underneath The Scream and watch people’s faces. The ride teases people with fear. It goes half-way up, then plummets back down . Then zooms all the way back up to pause for an extra few moments at the very top, before plunging all the way to the ground again. Shocked, screaming, big-eyed expressions, turn into huge smiles as people unbuckle at the bottom. During off-season you’ll find shorter lines. There are places to cool off and take a break. Six Flags is a good opportunity to literally hang out together, your feet dangling. There are decorated plastic bottles for sale on site for $13, and these can be re-filled for $1 with your choice of drink throughout the season. Although this is a higher cost outing, a good thing is that there’s no long drive. San Antonio is this close to thrill rides. There are also concerts held throughout the year. San Antonio's Toilet Seat Art Museum just might be the city's most unusual. Visiting this museum is a total experience. Long before the concept of "interactive museums," Mr. Smith had the force of his personality, stories and charisma. Visitors from all 50 states and many foreign countries have passed through the humble, but extensive, museum. The Toilet Seat Art Museum is located at 239 Abiso, in San Antonio, and can be viewed by appointment by calling 824-7791. Good straw fries. Unique and yummy frozen custard items. Nice red, black, and white decor. Greasy and tasty classic grilled sandwich. The smell of cinnamon greets you when you open the door of this shop. Behind the counter are shelves of plump, hearty loaves and other fresh baked goods like blueberry muffins, chocolate-frosted-chocolate cupcakes and sausage kolaches. Front and center are taste samples of the offerings of the day. The staff are helpful and will slice your loaf for you. Birdman bread is recommended. It has seeds, and will satisfy any craving for hearty, homemade bread. “You don’t even need butter for that stuff,” my son said about the classic white loaf (there's honey in it). If you get there in the morning you might see bakers pulling off and measuring lumps of dough onto scales for that day’s baking. They also serve coffee, and have a few small tables in the store’s front window. A short ways down from the Witte, on the opposite side of the street. The front wall is decorated with bright red tiles and colorful murals. One of the Great Wall and, “Greetings from the People of China.” After you enter the carved wooden doors, there’s a case of jade and gold jewelry and a table of exotic plants for sale. There’s one large, main seating area. On the ceiling are two neon crossed flags of USA and China. Decorating the walls are mosaic-type art made of butterfly wings. You heard me right. Hundreds of iridescent purple, and shimmering green wings are set in overlapping patterns to form amazing pieces. We had a rather curt but efficient waitress. Very fast service. Other staff were smiling and friendly – all of them very attentive. Absolutely delicious food. I’ve had a lot of Chinese food in my time, but this was truly the best ever. Very reasonably priced. Parking on the street and around the sides. Note: Bring cash. There is only one ATM semi-conveniently located within the grounds of the Institute of Texan Cultures where the event takes place. Admission is cash only and you then receive tickets for entrance. Food stalls as well, only take tickets for payment. Lots of different booths of edibles to try. Demonstrations of martial arts (many kinds). Sumo wrestling. Performances of dances of many lands. Alamo Music Center has been a San Antonio fixture since 1891. They represent expertise, and old-fashioned customer service involving respect and attentiveness. One example of this is that they naturally and pointedly greet everyone who comes through their doors. It’s evident that the sales staff are into music. They have that depth of knowledge that exposes itself casually when answering questions. You get the feeling that you’re touching the tip of the iceberg with your comments about all the different kinds of pianos. Next door is a German restaurant with delicious rumballs. You'll miss this if you don't know where to look. Overall this place has the feel of a favorite, comfortably worn-in upholstered chair. There are actually a couple of those set around to enjoy. As well as a soft couch arranged in front of the fireplace in this café / bakery. It’s located in an old house tucked down a small lane that begins almost opposite the outdoor treehouse at the Witte museum. The menu features gluten-free everything. It’s proprietor is very knowledgeable about special diet options. The cakes are a reason to stop by, in and of themselves. Dense and flavorful, they vary from coconut and lemon, to berry sponge. The staff are casual and attentive and there are a suitable number of attractive pine tables throughout. 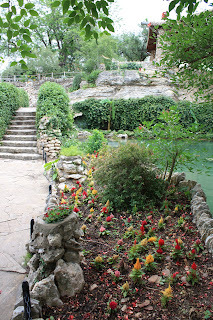 Another great FREE attraction in San Antonio is the Japanese Tea Garden, near the San Antonio Zoo in Brackenridge Park. It’s a lovely surprise oasis, planted in a former quarry used by a cement factory. Recently renovated and now featuring extensive stone paths spiraling from the low water basin up the high walls of the outdoor space. Gold, silver and mottled-black fish live and feed in the pools at the bottom of the basin. Vines climb the walls and a waterfall spills down three stories from the top edge. Pansies and various plants throughout – from gigantic to tiny - create a lush, tropical feeling. Outside one building is a Poinsettia plant growing higher than the tallest Spurs player. There are lots of built-in stone benches, and a suspended wooden bridge, crossing over from the tower of the now-retired factory to a covered pavilion area. Go for a long while or a few minutes, and repeat visits often. Chances are if you've eaten out with your grandparents it was in a place like this. The ambience and smells are familiar and nostalgic. You can hear the murmur of conversation and clink of silverware of fellow diners. Earl's has been in business since 1933. Clientele are as interesting as the history of Earl. There are a mixture of people eating. Different ages and professions, as evidenced by the hats (cowboy and baseball) and business suits (or khaki uniforms). Pies entice and serve as decoration, lining two shelves underneath a long mirror on the back wall. Cakes sit proud and tall, on stands under clear glass at the counter. When Earl began the business it was during the depression. He was trying to diversify, after a career as a silent film organist was ending. One day he hit on the idea of supplying customer's with jokes to go with their drinks, and this increased his popularity and business. "The reason a dollar won't do as much for people as it once did, is people won't do as much for a dollar, as they once did!" "It's tough to pay $1.25 for a steak but 50¢ steaks are tougher." The humor of course adds to the dining enjoyment.